We are ready to open the door to spring! We are discovering that some very ordinary items can create breath-taking spring displays. We suggest using green for sure, going to the birds for a cheerful attitude, and maybe even faking it for color. I used to really dislike fake flowers, but that was before the fabulous lifelike foliage that is available now! We can truly enjoy beauty inside even when it’s gloomy outside. 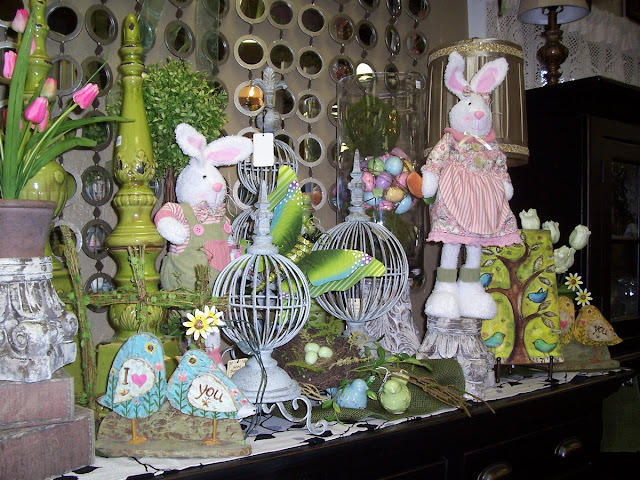 We’ve got really great spring décor along with fabulous new art, mirrors and lamps. The place is just stuffed with new merchandise so it’s definitely time for us to open and share with you. If you are looking for a few things that you just can’t live without…come see us. Come and enjoy making your place…no place like home!